Bairnsdale is a large provincial town situated on the Mitchell River in Gippsland, 285 km east of Melbourne. The Bairnsdale run, on the west bank of the river, was occupied by Archibald McLeod from 1844. It was named after his birthplace, Bernisdale in Scotland. On the eastern bank was the Lucknow run, taken up in 1842. The Aboriginal word for the area, Wy Yung meaning duck, now names a locality north of Bairnsdale. Gold discoveries in the surrounding area spurred the growth of a township at Lucknow. However the government township was surveyed on the west bank of the river, the first land being sold in 1860. McLeod also sold blocks in a township called Mitchell town, laid out on his land south of the present Main Street and adjoining the government township. 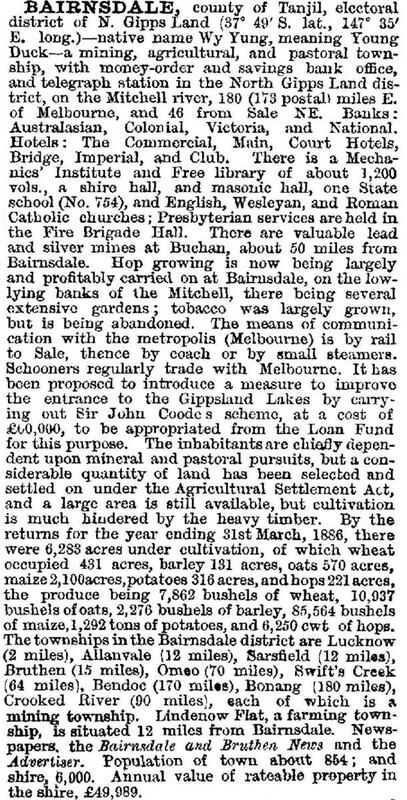 The township of Bairnsdale progressed rapidly. Soon there were hotels, stores, banks, postal service, court house, school, tradespeople and stock sales. The punt over the Mitchell River was replaced by a bridge. By 1865 there were about 300 people living in the town. 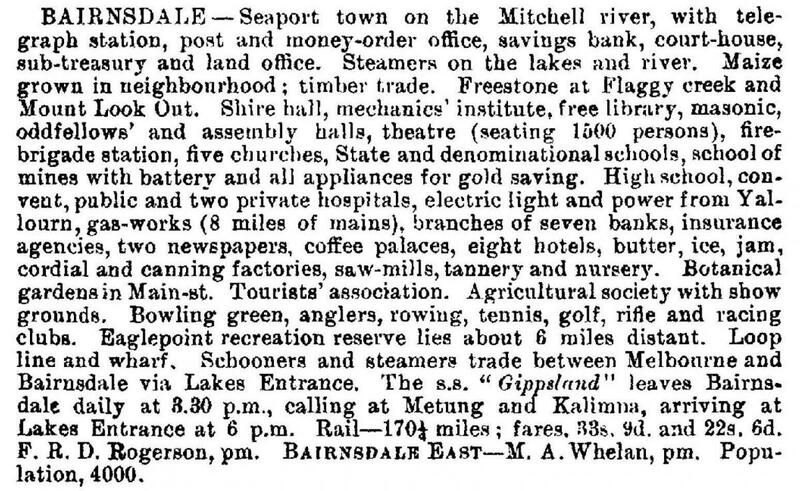 Bairnsdale became a Road District in 1867 and a shire in 1868. 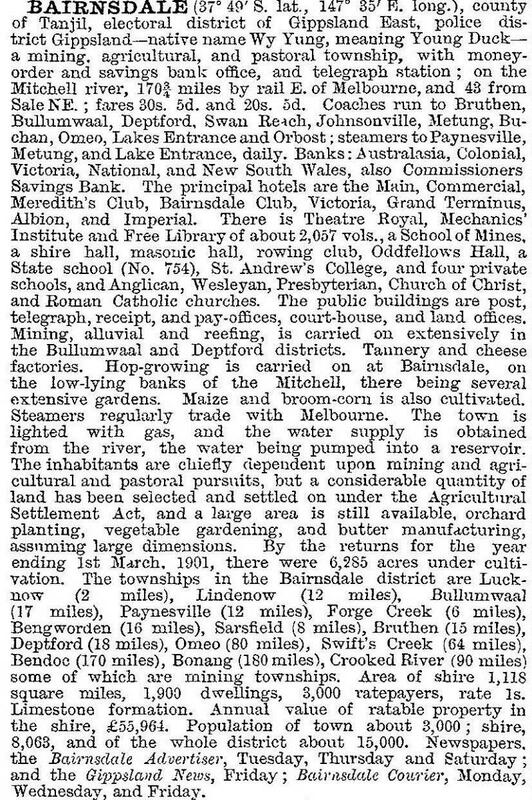 From the 1860s Bairnsdale developed as a port. The Mitchell River was navigable for several kilometres upstream of Bairnsdale. Steamers and boats plied the Gippsland Lakes and could reach the sea through the natural entrance at Lakes Entrance for communication with Melbourne. Livestock, timber, wattle bark, wool, skins and hides were transported to market. The town steadily prospered, becoming the commercial and administrative centre for a large pastoral and agricultural area. The port was thriving, with new wharves constructed in the early 1870s. Excursion trips on the rivers and lakes became popular, as described by the journalist ‘Tanjil’ in his guide to the Gippsland lakes and rivers. A connection to Melbourne and Sale came with the extension of the railway to Bairnsdale in 1888, causing a decline in the shipping trade. A School of Mines was opened in 1893 but development was slowed during the 1890s depression. Floods have been frequent, with particularly high levels in the 1870s and 1890s, and more recently in the 1930s, in 1949 and 1952. During World War II, the airfield south-west of Bairnsdale was used for military purposes. Passenger flights have operated since 1950 and helicopters involved in offshore oil searches use the aerodrome. Despite the rural recession of the 1970s the town progressed. Population steadily increased from 9130 in 1976 to 10,770 in 1991. In 1967 the town of Bairnsdale was formed by severing Bairnsdale and the surrounding urban districts from the shire. In 1990 it was proclaimed a city but in 1994 was amalgamated into the municipality of East Gippsland. It has a TAFE, secondary college (989 pupils, 2014) and primary schools (Bairnsdale 265 pupils, 2014), (Bairnsdale West 204 pupils, 2014), livestock industries, timber and engineering works, a vegetable processing plant, a hospital and an active retail shopping area. There are numerous sports and recreation facilities and a wide range of community organisations. In 2013 a redevelopment of Bairnsdale Secondary College began in order to merge the school’s two campuses. The rail line to Bairnsdale was closed in 1993, the service being provided by buses. The rail service was restored in 2004. Well known author, Hal Porter, spent part of his life in Bairnsdale and has described the town in an autobiography and a town history. Due to Bairnsdale's moderate climate and proximity to the Gippsland Lakes, tourism has become a major industry. One of the features of the town is St Mary's Catholic church which contains murals painted during the depression by Frank Floreani, an Italian artist. There are many fine buildings in the town, the most notable being the courthouse, an impressive building of arches, gables and towers. Krowathunkoolong Keeping Place is a cultural centre for the local Aboriginal people. The silt jetties at the mouth of the Mitchell River are a natural phenomenom of great interest. Formed by silt deposits as the river slows down on entering the lake, they extend nearly ten kilometres into Lake King. They have been eroding since the early years of last century but works are being undertaken to preserve them. McLeod's Morass, south of Bairnsdale, is a wildlife reserve with a boardwalk through the wetland. The Riviera Festival is held in March, as is the Marlay Point Overnight Yacht Race. In 2014 the town began to address issues caused by more than 80,000 grey headed flying foxes inhabiting trees along the Mitchell River. By 2011 the population included Bairnsdale's neighbouring built-up suburbs of East Bairnsdale, Lucknow and Wy Yung.